You know what? We eat our mistakes here. Sometimes you end up with a happy accident. Well, that happened today! There were two obstacles that I had to overcome in the kitchen today. It was one of those days where everything seems to go wrong but in the end, it turns out alright. The first hiccup in the kitchen occurred during lunch. I used Enjoy Life Foods gluten freeÂ pancake/waffle mix and put some LivFit cacao powder in the mix to make chocolate waffles. I have been craving breakfast foods like crazy and I had a craving for some waffles. 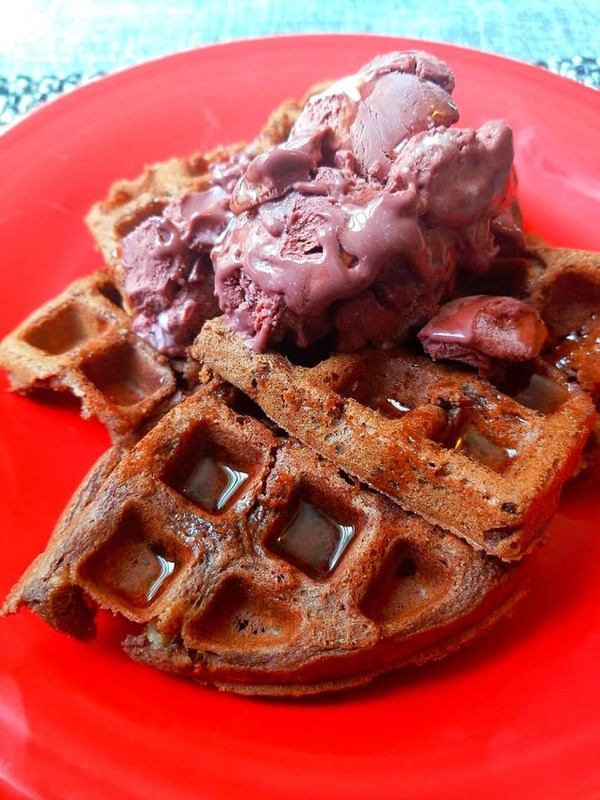 Here are my chocolate [messy] waffles topped with Enlightened Red Velvet ice-cream. I was so lucky that I was able to salvage these waffles because they tasted incredible. It was my first time trying out this gluten-free waffle mix. Enjoy Life is free of many common allergens: wheat, dairy, soy, sulfites, peanuts, tree nuts, casein, egg, and more! That makes this mix vegan and paleo friendly! My daughter and I grabbed two forks and fought over every bite… it was that good!Â The presentation was not there but the flavor combo of the waffles with the ice-cream was on-point! And we also had to add a bit of maple syrup because a waffle is always deserving of that. If you are looking for a healthy option for ice-cream look no further than to Enlightened! The entire pint of this particular flavor is only 280 calories and only 5g of net carbs. I will be doing a post in more detail soon about this product. The Red Velvet paired perfectly with the chocolate waffle. This flavor has a cream cheese frosting and chocolate flavor. The second obstacle that happened was during the dinner hour. I was whipping up more breakfast food. Whenever I have breakfast for dinner I like to call it “brinner”. This time I was making some paleo-friendly French Toast with chia and flax seeds. I am trying to boost my fiber intake and adding those seeds really assists in some smooth moves. I also really enjoy paleo baking. I have this thing for making fresh, gluten-free breads. It brings me a lot of joy. This particular recipe for the bread used coconut flour. I used a square baking dish and that gave me 4 nice, thick slices of bread to work with. The batter was egg-free and I used a mashed banana mixed with some unsweetened almond milk and cinnamon. I also made some caramelized bananas, using coconut sugar, to top the French Toast. I had my bread baked and cooling on the countertop. My batter was prepped and prepared. The bananas were caramelized. All I needed to do was cook the slices that were dipped in batter. Then all of the sudden out of nowhere we experienced a power outage! It was totally unexpected because there was no inclement weather. I was a little bit freaked out at this point. How was I going to cook the rest of my dinner without any power? Thank goodness my hubby came home from work. We brainstormed and came to the conclusion that our best bet was to bust out the cast iron pan and finish “brinner” off on the grill outside. Genius plan! It totally worked too. I am so happy to report that my little family of 3 enjoyed this meal. Each one of us joined the Clean Plate Club and were left wanting more. It was so delicious! Next time I make this dish I will be sure to have more bananas because those were like eating candy! Cooking sure does require a lot of critical thinking and problem-solving skills. Knowing what to do when things are not going your way is critical. My two problems in the kitchen turned out awesome in the end. So when you are cooking do not be discouraged if things are not going the way you intended them to. This entry was posted in My Cooking Journey and tagged bananas, breakfast, breakfast food, cooking, enjoy life, enjoy life foods, enlightened, enlightened ice cream, french toast, healthy, healthy breakfast, healthy food, healthy lifestyle, ice cream, kitchen mishap, paleo, red velvet, waffle, waffles. Bookmark the permalink. Awesome that it all worked out! The meals sound so yummy! I know you have one happy little family from all your fabulous cooking! Thank you! I do try my best and give it my all. So glad you’re having fun in the kitchen. All your recipes look so great, and healthy! Wish I enjoyed cooking.